A street where nothing is the same | Drake in D.C. 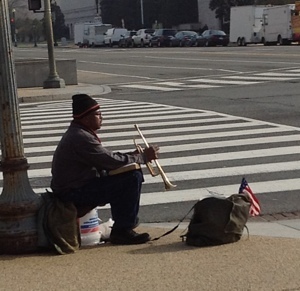 The streets in D.C. change names faster than the metro can get to the next station. With roads that are named in alphabetical order, by numbers and by state names in theory navigating the city should be simple. If only. While the travels were difficult they ended up being worthwhile and when in doubt Lucas Baker aka Papa Duck (because we followed him blindly like little ducklings when we got lost) always seemed to know the way. Despite our initial struggles, we all learned a few tips and tricks to survive and thrive while exploring D.C.
– Our first expedition on the metro as a group took us to the Smithsonian “Castle”, an impressive building that is the main headquarters for all of the Smithsonian museums where consequently James Smithson’s, the founder of the Smithsonian Institute, tomb lies for public viewing. With a gorgeous garden and random trees such as the “Monkey Puzzle”, this spot proved to be unique and historically significant. Getting to this place though was a whole different story. As what we will refer to as “metro etiquette”, there are a few ways to avoid getting in too much trouble underground. First off, the people here are busy and move quickly and efficiently. Dawdling will only get you run over so whether you’re confident about the direction you’re going or not: move with a purpose. When traveling in a small group, always communicate before getting on the metro about which stop you’re getting off on. With so many people packed into one car it’s important to know when you’re getting off since its so easy to get separated. 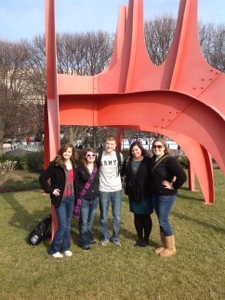 – The “Chevel Rogue” or the “Red Horse” by Alexander Calder was our next destination and is located in the Smithsonian Sculpture Garden. Calder is best known for his invention of the mobile. Surrounded by a shiny silver tree and other sculptures, the garden is full of some amazing artwork that should not be overlooked. Both George and Johanna both have an idea of what they want to hear for Obama in his speech. They want to hear a renewed message of hope and that he will be more of himself as he returns for four more years. – Our next stop on our journey led us to a sunshine yellow building where the Presidents have been known to attend a religious service. So much so in fact that the church of Saint John’s has been coined the nickname as the “Church of the Presidents”. 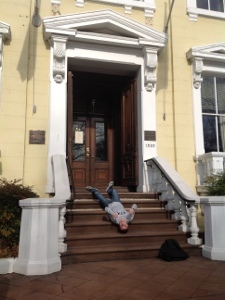 Lucas gamely laid upside down on the front steps and we disappointingly missed the Eucharist that day by ten minutes (maybe next time!) 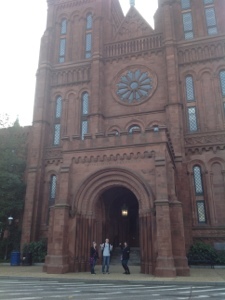 however the beautiful classical architecture made the building a sight worth beholding. The stairs on the metro near this stop lasts a solid two minutes on the escalator you’re so far down. While some are moving at a quick pace and hurriedly brush by people on the stairs, those that are traveling at a leisurely rate stay to the right. An important move to not get pushed over by some busy person. Once reaching the area of light aka street level the intersections start to gain complexity. In the midst of all the craziness we quickly learned to utilize a map and learned to know where our landmarks are (What direction is the White House from here? What was on that corner that we will remember if we get lost?). – After a a crazy whirlwind of a morning (with more walking than any of us imagined!) 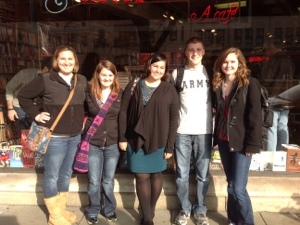 we were lucky enough to snag a table for all five us at Kramers Bookstore and Cafe. With books crammed in every nook and cranny (with a lot of random subjects and titles) this place was clearly a local favorite and was completely packed. We enjoyed a delectable brunch there where we dined on fresh squeezed orange juice, whole grain waffles, mini muffins, fresh cut fruit and omellettes (even one named after Barack Obama!). Despite the pricey menu it was a well deserved break and re-energized us for the rest of the day. We took a lot of group photos along the way and the key to getting a nice native to take your photo we learned a few ways to get a good photographer. First off, parents are the nicest. See someone with a kid holding their hand? They’re probably nice enough and in not too much of a hurry to take our photo. And when the pickings were slim we found that just asking proved surprisingly fruitful. The only drawback was trying to find people that even knew how to use the iPad we were asking them to take our photo on. Big thanks to all the people who stopped to help us out get collective group photos! – in the most random location in the city is the most depressing looking park you’ve ever seen. We double-checked our map to see if this was really the spot. 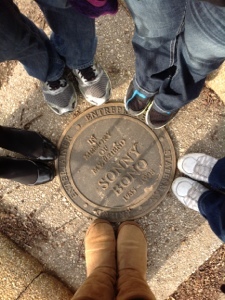 At the corner of three streets, right in the middle, is the Sonny Bono Memorial Park. All that marks it as such is a small circular plague with his name embossed on it. It seemed strange to us that such a public figure would have such a small, seemingly unmarked memorial park. We were unable to stay here too long I order to make it down to Watergate in a timely manner but this strange slab of cement between streets proved an interesting stop. As convenient as the Metro may be, it can also be unpredictable. sometimes the train would get there in two minutes, while other times it would take twenty. After the Bono park, the nearest Metro station turned out not to be open; we were forced to walk to the Watergate Building as our final destination. Sometimes, it can just be easier and more convenient to move your feet! 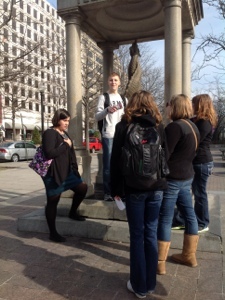 Pingback: Day 2: Learning the city « Drake in D.C.